Our gentle soap free exfoliating wash uses natural Jojoba beads( NOT SYNTHETIC MICROBEADS) to remove surface dead skin cells revealing a younger looking more vibrant complexion. 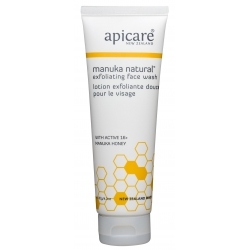 Soothing aloe vera and hydrating manuka honey will tone and soften your skin. Gentle enough to use every day and fragranced with pure essential oils. A supremely effective, foaming, soap free exfoliating face wash to remove surface dead skin cells and encourage new cell regeneration without drying or irritating your skin. This clever combination of Aloe Vera to soothe, active 16+ Manuka honey to hydrate, antioxidant green tea extract and super gentle exfoliating Jojoba beads will soothe, tone and soften your skin. Pay attention to dull areas to target those areas that require maximal exfoliation. Your skin will be cleansed, radiant and free from impurities. A divine face wash that is suitable for all skin types and gentle enough to be used daily. Jojoba beads are made from natural Jojoba wax esters. They are free-flowing, microspheres which are perfectly round with no sharp edges. This makes them superior to nut shell, pumice and polyethylene exfoliants for facial skin care products, because they do not leave micro-lacerations, which damage the skins surface. Exfoliating agents that do create microscopic cuts can result in premature wrinkles and provide an entrance for bacteria into the skin's surface. 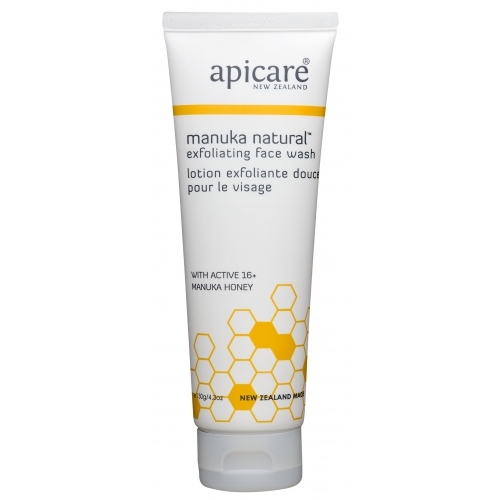 Manuka Honey is tested for its non-peroxide level of activity and issued with a number. So a rating of 10 indicates the same level of antiseptic potency of a 10% solution of Phenol (Carbolic Disinfectant). The higher the rating, the higher the activity level is, and therefore the greater the healing ability.